Yss is a shard realm filled with a myriad of environments, from the mundane to the reality defying. A realm of ancient kingdoms and fresh frontiers, treacherous oceans and unfathomable subterranean expanses. As such, its inhabitants are as varied and colourful as the places they inhabit. In the Grunvale and its surrounding regions the Free People settled, building great cities and forging vast nations. In the distant west on the Al’Arkan peninsula, explorers led intrepid colonists from beyond Yss to settle the coastal regions, with powerful city states blossoming on the fringes of the great deserts, the vast savannahs, and primordial jungles. Amongst the alpine peaks of the Reach lies the great elven province of Ahmarha, its citizens hardy and pragmatic. In times of war, hunters, woodsmen, and pathfinders answer the call to protect their secluded alpine realm. In the north lies the the Uilebheist Plateau, a nest for all manner of primal horrors too terrifying to describe. And beyond that is the Sundered Veil, a vast stretch of lands tainted and misshapen by fel magics during the Age of Chaos, a realm of unnatural horrors. Gibbering men cavorting amongst the ruins of lost kingdoms seeking eldritch power and the patronage of abyssal beings. To the east of the Uilebheist Plateau is the Isle of Elthuin. An ash choked volcanic landscape with vast tunnels that lead deep into the under realms below. Few travel there, the stories of the Ashen keeps sane folks away. ~Jhez Al’Waide, Explorer and Scholar at the University of Fyrdhathen, Professor of Psariology, Amphiviology, and Yssian History. Author of the “The Fulminous Kings: The Concise Lineage of Esel’s Royalty” and “The Spined Merwyrm: The Fisherman's Bounty”. The rise of the powerful warlord Budahk Chain-Gor is a lesson in the Minos society. Of huge stature early in life, he soon gained the respect of dark warrior kin and orc-foe alike, due to his shrewd tactical awareness and ferocity in battle. Minos culture has two clear methods of promotion. One is to kill the incumbent in a straight fight. The other is staggeringly subtle, and would be missed by most. A simple nod of submission and the leader submits to his superior challenger. It is said that Budak, having defeated a particularly cunning and brutal Orruk Warboss, laid his kill as a sacrifice before the venerated Cygor, Bogut the Unworldly. Bogut, struck by religious fervor, then laid prostrate before Budak. A sign that Budahk had truly honoured the gods and was marked for greatness. Upon seeing this Budaks warmaster, Hacker Bloodhorn, submitted with a simple nod, and Budak was now Warmaster of the Northern Herds. Upon killing the last rival warmaster, Gruffen the Three Armed, King of the Southern Herd, by butchering him alive and finishing him by strangling him with his chain whip, Budak enjoys an undisputed autocracy. Having unified the Minos, the brayherds, and beasts of the Uilebheist Plateau, he has brought the Orruks to a tepid truce based upon fear, respect, and a healthy stream of trade, mostly slaves. ~ Verse one from an Esellian folk song, often used to scare children and adults alike. Czarny Jacek, aka Karmínová Sekera, aka Czerwona Pięść, Captain of the Crimson Guard. His names are many in the Deiran tongue *, Czarny Jacek, Karmínová Sekera, Czerwona Pięść **, but we'll simply use Jacek for the purpose of this entry. Jacek has long held the reigns of the Crimson Guard. The tales associated with Jacek are littered with folk foolishly trying to stop him and the Crimson Guard from their course, from bands of Eselian knights to brash watchmen and adventurers, all felled by his poleaxe and the blades of the Guard. There are many accounts of villages and townships beset by marauding forces suddenly being freed from their terror, the Crimson Guard appearing in the night and hacking apart the assailants and leaving grisly displays as warnings to others that might try and prey on the common folk. ~Excerpt from "The Lore of Yss" by Jhez Al'Waide. *Or Nord Eselian if you subscribe to the court approved Eselian Historical Treaty, a rather dull tome filled with mendacious accounts of Eselian history and "ancient" claims to territories via blood rights and writs of forfeiture. ~ Jhez. **Loosely translated into the common tongue as Black Jack, The Crimson Axe, and The Red Fist, respectively. ~Jhez. Incredible miniatures ! I love your crimson guard specialy. Can't wait to see more, your painting it's reall great !! Wow you have some great and characterful minis here. I really like, what you show including the storyline. 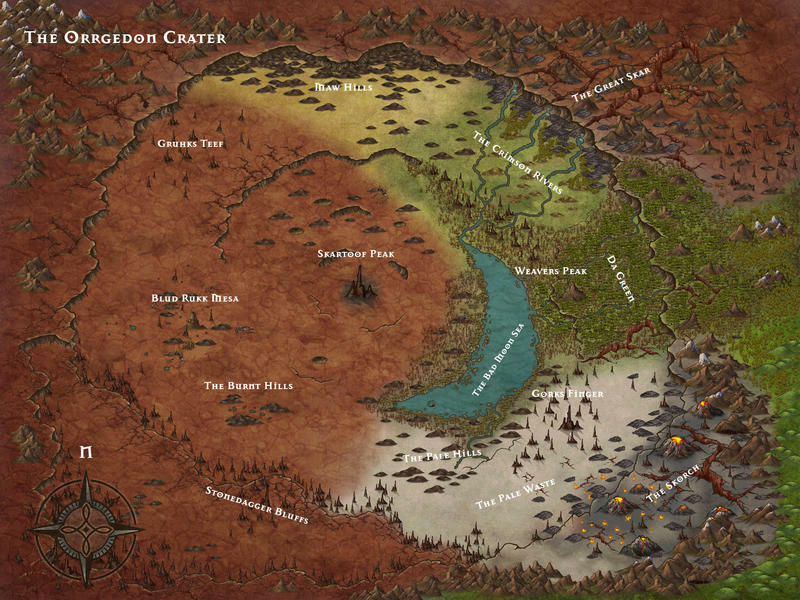 The Orrgedon Crater is home to monstrous beasts, savage humans, beastmen, and all manner of greenskins. Blasted into Yss’ surface shortly after its formation, the Orrgedon Crater was created by a large piece of fused realmstone plunging from the ether. There are some amongst the academics of Yss, that believe the debris from that event created Thuine, Yss’ moon. The crater is home to a diverse and terrifying ecosystem, one that pushes survival to the extreme and creates hardy flora and fauna. As such it is unsurprising that orruks and their ilk are drawn to the area. Under the great peak at the heart of the crater, the very realmstone that created the crater hangs like a jagged tooth from the roof of a vast cavern. This place is venerated by the greenskins of Yss, it draws the orruks and grots of the region to make pilgrimage there, as it is infused with Waaagh energy in its rawest form. The greenskins of Yss believe that the “Toof” was one of Gorkamorkas teeth that he spat out during a brawl with Sigmar, and as such is infused with his essence. No clan rules over Skartoof Peak. Only maddened Shamans, Weirdboyz, and their mushroom addled servants live there, guarding the cavern, cultivating the unique mushrooms that grow there, and tending to the innumerable squigs that reside within the tunnels and caves of the peak. The crater harbours all manner of monstrous creatures, Basilisks, Dreadmaws, Arachnarok, Gruntas, Maw-Krushas, Wyverns, along with Drakes of all forms and variety. However the most common creatures are squiggly beasts, or “Squigs”, that come in innumerable forms across the craters environments. From the common squigs that live beneath the mountains and in caves, to gargantuan squiggoths that roam the vast wastes and plains. Across the region, there are many human and beastman tribes wandering the area and carving out territories. But they are vastly outnumbered by orruk and grot clans and the various tribes and factions amongst them. 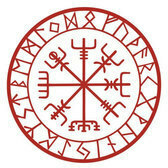 Each clan and tribe is unique, with their own beliefs and traditions. Many follow the savage path, eschewing armour and carrying stone weapons, while others actively create and scavenge metal. The pyromaniac orruks of The Scorch use the primal heat of the land to forge armour and weapons. Whereas the orruks of The Pale Waste use obsidian shards dug from under the ash hued sand, and bone taken from beast and kin to fashion their weapons. Orruks and grots from Gruhks Teef through to the Stonedagger Bluffs reside amongst the cliffs, mesas, and rocky hills so as to have some respite from the searing heat of the red desert. The clans and tribes of the Crimson Rivers and the Maw Hills tend to live in the saddle, keeping large numbers of boars, gruntas and squiggoths, so as to maintain a semi nomadic lifestyle. The orruks and grots of Da Green are a sinister bunch that outsiders are wary of disturbing, rumours of strange temples and effigies put off even the most belligerent boss from trying to lead their clan or tribe into the area. The Great Skar is home to many trogg holds and grot lairs, no orruk lives there and few venture through it unless they are en masse and moving to the reaches beyond it. Staying there too long either ends with a shiv in your back while you sleep, or waking in a cave just prior to becoming a meal for some beast. Thankfully for the rest of Yss and the other inhabitants of the crater, the orruks and grots are almost permanently at war with each other, with numerous tribal and clan disputes fueling their natural drive to fight, destroy and despoil. But the clans and tribes do on occasion pour out of the crater, either with allies or on their own, into the lands beyond. Often garnering the attention of greenskins in the areas they move through, riling them up so they join the Waaagh and steamroller regions until the Waaagh loses momentum or is destroyed. A wip shot for folk of the next Brute squad. As the Brutefist formation can take a Big Boss, I decided to make their leader a little larger and generally more imposing. You already know I love all of this, you beautiful hobby person you, but have some more kudos because ****** you deserve it. Especially for those Ironjawz. My word. The minis are great, the background is even better. Really great stuff. Wonderful stuff. People like you remind me why I still love this hobby after thirty years. Did you draw the map yourself or did you use a software? 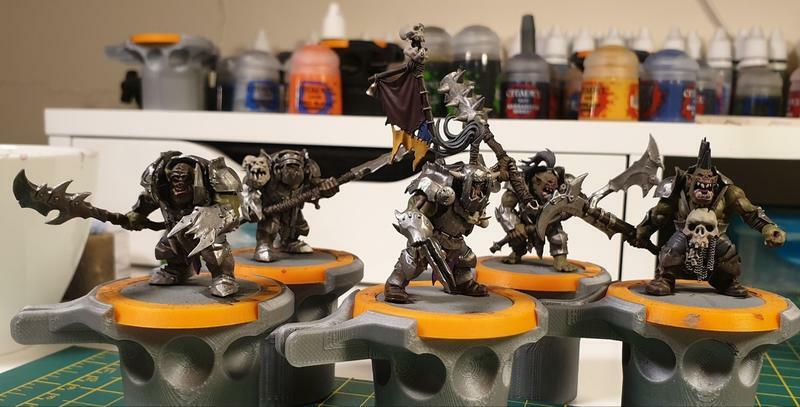 The miniatures are very well painted and all! It motivates me so much! 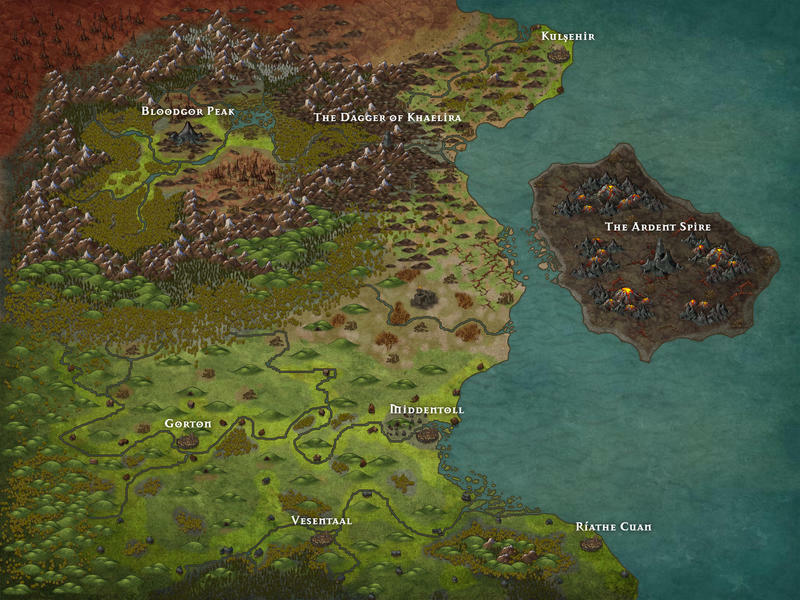 @Velius, I used Inkarnate, specifically their pro version. to do all my maps.  The pro version is subscription based and grants you commercial use. A small heads up guys, I've set up a seperate Lore of Yss blog. It'll be the first port for polished pieces featuring background and finished models, but I'll still be posting this stuff here too, and all WIP stuff will be featured here. The Orruks of the Iron Moonz Clan are well known across Yss, their exploits are legendary. A nomadic clan originating from the Orrgedon Crater, the Iron Moonz have fought an unbroken chain of wars for just over six decades. Some of these conflicts have been driven by the inherent Orruk need to destroy, but just as many have been for pay. The Iron Moonz have a strong mercenary bent, willing to take payment in many forms, from whomever is willing to stump up their fee. Hiring the Iron Moonz isn’t without risk though. The fractious nature of Orruks coupled with the capricious and eccentric personalities noted amongst the Iron Moonz clan has led to many employers falling to a grisly fate at the hands of their erstwhile “allies”, either accidentally or with vicious premeditation. Yet many still take the gamble to secure the Iron Moonz muscle, often at times simply to deny the opposition their strength, or to assuage the clan and hopefully prevent them from turning their attentions to their lands. The clan travels as a vast caravan mounted upon all manner of contraption and beast. Most travel upon squiggoths, living on howdahs made of iron and steel alongside their compatriots, while some choose life in the saddle riding a Grunta. 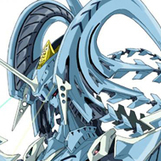 The clan leader, Urzod, resides in a towering pile of metal atop a titanic Squiggoth. So large is this beast and it’s howdah, that it comfortably holds Urzod, his lieutenants, an army of grots, and his Maw-Krusha mount, all in something akin to Orruk luxury. It is a truly terrible sight to behold, a moving castle, jutting metal bourne by tusks and teeth. There are a number amongst the Clan that use more unusual mounts and contraptions as homes, Rukgob and his “Raiderz” ply their trade from a captured Arkanaught Ironclad, while Oddboy Krug and his Bolt Chukka Boyz operate from a multi legged mechanical tower littered with loopholes. The clan is unusual compared to other Ironjawz clans, as they keep large numbers of grots and snotlings around to perform menial tasks, tend to the clans squigs, act as fodder, or as part of the entertainment between brawls (A squig fight isn’t “proppa” without at least one terrified grot hurled into the ring!). For the most part, the grots and snotlings live with their respective owners, but many live in their own caravan of cobbled together carts, sledges, and land skiffs. The grots and snots, when not herded into fighting, are usually found looting everything they can. It tends not to matter if it’s battlefield loot, the local villages prize pig, or the spare set of fancy pantaloons that their employer left in his camp tent, everything is fair game to them. Their hierarchy is fairly simple, dependent on the Orruk you are “favoured” (i.e, least brutalised) by, the higher your standing amongst your fellow grots and snots. As such, Urzod’s favoured grot, Skabbi Legshanker, is leader of the clans grots and snots. 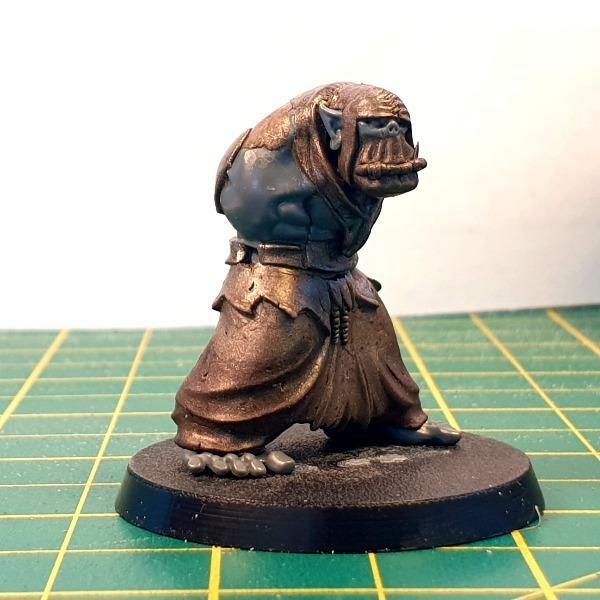 A position he unexpectedly came to hold after he was randomly selected from a brawling pile of grots by Urzod to care for his favourite pet squig, Gitbiter. The clan has been involved in numerous conflicts across Yss, starting a great many of them. The rampage through the elven Kingdom of Amhara with Arch-Loon Grimflint of Skizzlepeak. Their wrecking raids into Esel at the behest of neighbouring rivals so as to weaken their forces prior to invasion. Subduing the Hrahk tribes and becoming the saviours of the Rand Confederacy, then becoming enemies of Rand for assisting the remaining Hrahk and the slavers of Kulsehir in raiding the coastal region north of Middentoll. The Scouring of Aqu’Selaq, a city in the Al’Arkan Peninsula long abandoned due to an infestation of monstrous ghouls, the clan drove the beasts out into the desert allowing the city to be reclaimed by their employers. The clans tales are many, as are its characters. As such I will endeavor to catalogue them as thoroughly as humanly possible within these pages, and in as much detail as possible. ~ Excerpt from Wilhelm Kruper’s “A Study in Green”, compiled (with permission) into “The Lore of Yss: The Encyclopedic Study of Yssian Culture and Lore” by Jhez Al’Waide, Explorer and Scholar at the University of Fyrdhathen, Professor of Psariology, Amphiviology, and Yssian History. 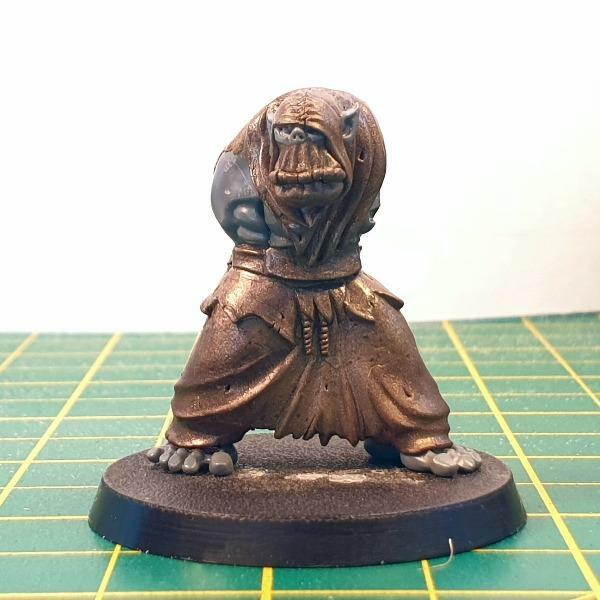 Currently on the workbench is the early stages of my homage to Brian Nelson’s classic Orc Shaman, Nazgob. I’m oddly nervous about working on this guy. Nazgob is one of my favourite classic orc models, so the self imposed pressure to get him to look right without being a direct copy is quite palpable. Work on the main torso and head are coming along nicely, and I should be test fitting his arms soon prior to sculpting his staff. This is the most sculpting work i've done so far, and I'm really enjoying it. If it goes well I may look at doing a full sculpt of my own at some point soon. 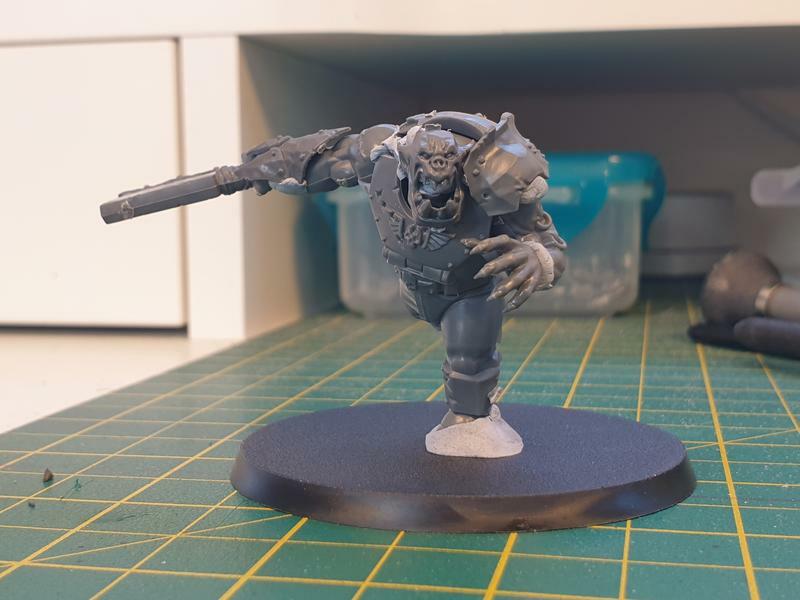 While I've been working on Nazgob I set about the next character, Warboss Morgrim, Megaboss Urzod's right-hand Orruk. So I'm pretty set on Megaboss Urzod being mounted on a Maw Krusha or some similar beast. 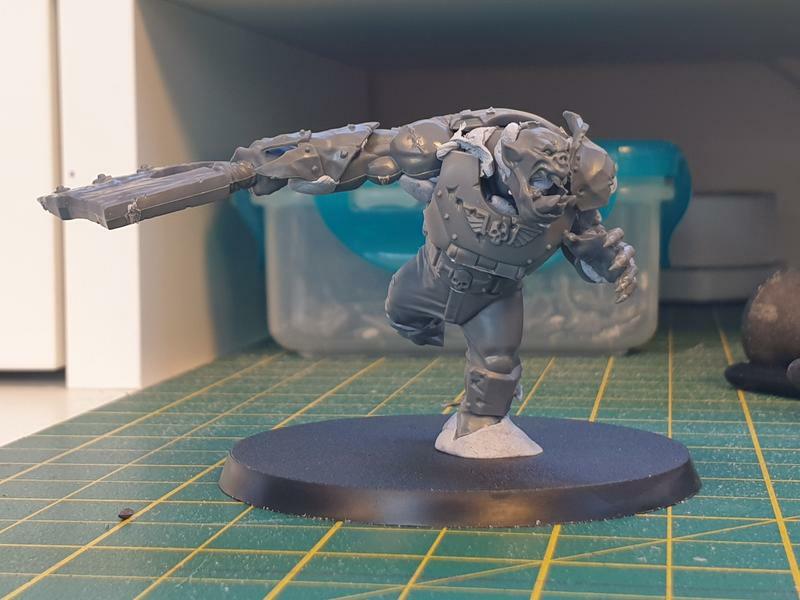 I also want a Megaboss on foot, but both the mounted and foot one have too similar a silhouette and wouldn't really show the foot one as being lower ranking than Urzod. So I've set to making one that's less armoured and closer to the grunts look, while clearly being their superior. So I dug around, found some bits, procured some others, and I roughly cobbled them together. And this is the result so far. He'll need a fair bit of work, but I think he's heading in the right direction. His armour will be reworked so it matches the Ironjaw aesthetic and he'll get a matching set of pauldrons too. Thanks Vasshpit. Hopefully there will be some more pics over the next few days now that components have cured fully and given me something to work over. So the Lore of Yss project is just over two years old formally (Previously it was just “The Grunvale” till we expanded it), but far older in concept. 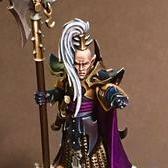 My friend Phil and I started it properly so we could take advantage of the clean slate that the Age of Sigmar offered, allowing us to explore old concepts and build something that we could blend into the larger universe. The freedom to theme armies and realms was delightfully refreshing and we quickly came up with reams of background, armies and kingdoms in our heads. So much so that we are still trying to get it all on to paper so we can share it. Much of what we started was centered around a single region and its kingdoms, The Grunvale and the metropolitan city of Fyrdhathen (Fairhaven as it was). Once we established the core kingdoms, numerous others started forming and growing, their politics, their themes, and how they all interplay with each other. Naturally this has made writing down everything even more complicated. Despite all of the kingdoms we’ve created, we have yet to actually make anything from those kingdom for the tabletop (bar a few rpg characters), instead focussing on Urzod’s mercenary greenskins, Budahks herd, and some of the Revenant forces that roam Yss. We may get round to making skirmish groups and RPG character for these other regions, but we may not. However, we want to share everything that we possibly can. So we plan on writing up some descriptors and army suggestions for the kingdoms we have so far in the hope that we, but more importantly so others, can potentially use them as guidelines and build one of the many and varied forces that inhabit Yss. I hope that some of you will at least take some inspiration from the forthcoming scrawlings and ruminations, and doubly hope that some of you may wish to join us in building Yss and a community around the concept. 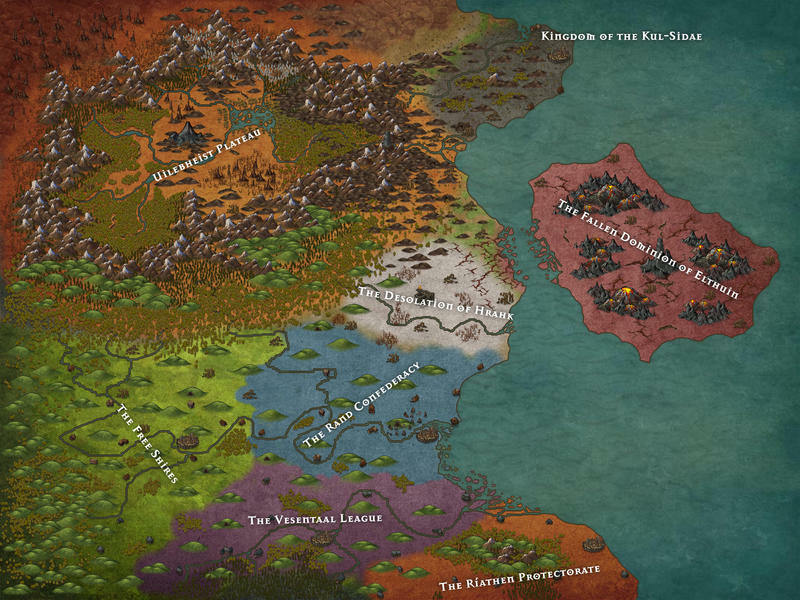 The first three kingdoms we will cover will be the core ones that we have built up the most, The Kingdom of Esel, The Republic of Fyrdhathen, and the Mere March.